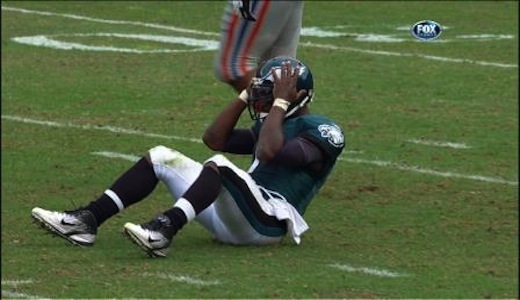 Last week all the Philadelphia Eagles fans in this country held their breath after seeing superstar quarterback Michael Vick go down with a concussion in the loss to his former team in the Atlanta Falcons. There was no question that Vick would suffer an injury at some point in this season as he has only completed a 16-game season once in his NFL career, but a lot of fans in Philly were hoping it wouldn’t be in Week 2 that he would already start getting banged up. Fortunately, Michael Vick was cleared to play in Week 3 against the division rival New York Giants, but it was basically the same story in the injury department after Vick went down with a broken right hand. Even though Vick is left handed, the Pro Bowl gunslinger wasn’t himself after the injury and as result the Philadelphia Eagles lost their second straight game of the season with a 29-16 loss to the Giants. Not only does this loss hurt the Eagles’ chances of coming out on top of the always competitive NFC East division, but the offense just flat in Week 3 against the Giants. Along with the offense struggling without Vick, the defense also failed to live up to the hype as they were unable to contain Giants’ quarterback Eli Manning who threw for 254 yards and a career-high four touchdowns. Personally, I believe the first two losses of the season for the Philadelphia Eagles are a fluke because the team wasn’t 100% healthy. Despite the fact that the Eagles are banged up, especially at the quarterback position with Michael Vick and Vince Young suffering from injuries, this team should get back to form sooner rather than later. There is way too much talent on this football team on both sides of the ball for them to fail to be a playoff team this season. The one thing that needs to change in my opinion is the play calling from head coach Andy Reid and company. If Reid can figure out how to use Vick the right way and limit senseless injuries, the Eagles will flourish and quickly become one of the best all-around teams in the league. Until that time, the Philadelphia Eagles are bound to struggle and are destined to suffer injuries that will keep them from reaching their potential. At this point in time, Michael Vick’s status for Week 4 against the San Francisco 49ers is uncertain, but considering the fact that his right hand is not part of his throwing arm, I believe he will be back on the gridiron next weekend. Even though I believe that Michael Vick has gotten the short end of the stick with his role in Philly due to the fact that he can’t get the protection or the calls from the refs for late hits, the Pro Bowler needs to learn how to adjust his game by throwing it away when in trouble and sliding when on the run. If Vick can master this like he did with his passing when arriving in Philly, the rest of the league will have no answer for him.